A picturesque and quaint market town in the heart of Dorset, Bridport is the ideal destination for a romantic weekend break. Barely 1 mile from the English Channel and teeming with homely bars and gourmet restaurants, scenic walks and lively markets, Bridport bares all the Old World charm you could want from a historic English market town. Whether you're traversing the Jurassic Coastline, watching the tide recede from a cafe or buying a hat from a local independent retailer, you will be enchanted. 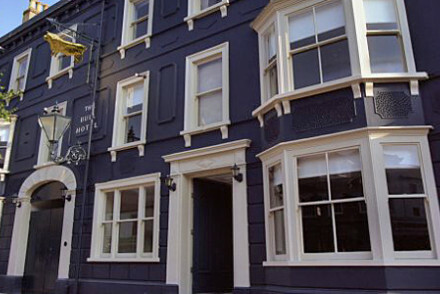 Check out our collection of the best places to stay in Bridport to find out more. Surrounded by miles and miles of beautiful Dorset countryside, Bridport nestles in an envious position. The filming location of the TV series Broadchurch, it is a homely town full of warm and welcoming people. With miles of hiking routes and great walking spots - like the climb up Colmer's Hill or the trek along the Jurassic Coastline - visitors can easily discover the enduring magic of the Dorset landscape. But the quaint nature of Bridport is best surmised by the presence of England's only remaining thatched brewery, Palmer's, who offer excellent guided tours around their establishment. Beer-swillers will also enjoy the selection of local pubs - The Bull taking first place, offering a homely and lively evening - and cafe-goers will love the Watch House Cafe in West Bay, a nearby fishing village 1 mile south. Take some time to stroll around the town. Be sure to visit the Bridport Market, running on Wednesday's and Saturday's, selling everything from antiques to local jams; a visit to the Bridport Museum should be on anyone's sightseeing list, as it boasts an impressive collection of fossils and historical artefacts, and the Charmouth Heritage Coast Centre is the best place to go if you're keen on fossil-hunting at a nearby beach like Hive Beach. If you love indepedent retailers and boutiques then Bridport is the place to be: T. Snooks, an old hat business running for over 100 years, is a must-do - be sure to buy a hat as a souvenir of your time there! Take a guided tour of Palmer's, England's only thatched brewery! Enjoy exploring the Dorset countryside by hiking along the miles and miles of routes. Head to West Bay and sip a coffee as you watch the tide recede! Enjoy a warm and fun evening at The Bull. With some help from the Charmouth Heritage Coast Centre, go fossil-hunting at the beach! Buy some antiques or rare objet d'art from the Wednesday or Saturday market. Go for a climb up Colmer's Hill and drink in the awesome views! Try on hats at T. Snooks, an independent hat-maker that's been running for 100 years. Bridport is picturesque and charming, the ideal place for a romantic weekend break. Our selection of the best places to stay in Bridport all prize tradition and homeliness above all else! The Bull Hotel: an 18th century coaching inn beautifully renovated with modern flourishes, offering rooms with ornate wallpaper, antiques and brass beds. Enjoy the two restaurants, with an emphasis on locally-sourced seafood, or the popular Venner Bar. The Seaside Boarding House: perfect for a laid-back break, this charming hotel nestles on the coastline on the outskirts of town. With gorgeous contemporary rooms boasting beautiful views of the Bay, an excellent seafood restaurant and a cocktail bar, you can't go wrong. Our partner Booking.com has a range of cottages and apartments in the nearby area. Fly to Bristol, get a train to Maiden-Newton - 12 miles from Bridport - from where you can get a bus or taxi to Bridport. The best time to go is during the summer, when the temperature ranges between 12 and 20 degrees. An 18th century coaching inn, yet full of fun from within. Rooms are decorated with individual touches like ornate mirrors, brass beds to antique dressers complete with floral Cole & Son wallpapers. There are two restaurants, with an emphasis on locally sourced seafood and the popular Venner bar. Local markets - Bridport market, open Wednesdays and Saturdays is perfect for hidden gems and bric-a-brac. Great walks - This is the gateway to the Jurassic Coast with all its dramatic coastal paths. Sailing - Lyme Regis is a sailing mecca and a quaint town to spend an afternoon. Sights nearby - Country house lovers will appreciate Mapperton House.